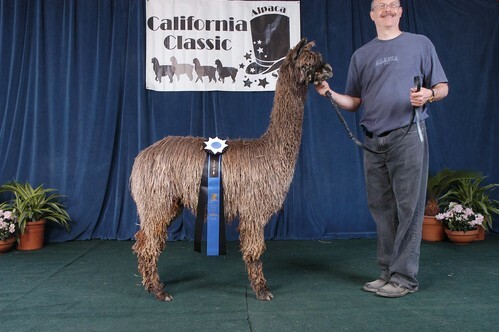 Openherd: SoCal Suri Alpacas is a farm located in Woodland Hills, California owned by Michael Frankel. Pisco is proud of his wins! We are proud of Samichay's wins! Because we have taken a different approach to alpaca ranching, we can offer a unique perspective on the alpaca business. 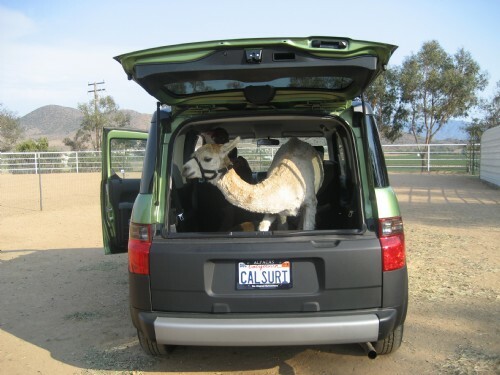 We continue to work full-time in our professions in Southern California, dreaming of the day that we will bring our alpacas to our ranch property in Marin County, north of San Francisco (you know...hot tubs, Jerry Garcia, "flower power"...well, things HAVE changed since the 60's!) Since 2006, we have agisted our alpacas at five different ranches on the West coast--from Northwestern Oregon to Southern California. 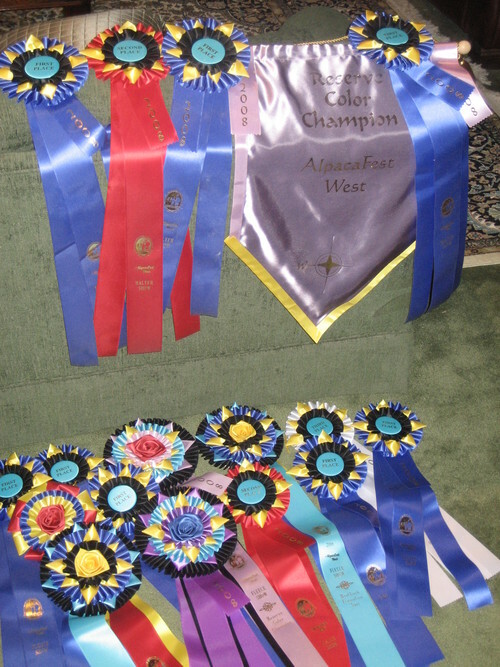 We see this as a real advantage--we have learned different approaches to alpaca husbandry and sales from a broad spectrum of successful alpaca ranchers. Additionally, we have expanded our contacts to the Midwest and the East Coast, as we have sought to purchase high quality animals from coast to coast. When you develop relationships with ranchers across the country, you have mentors all over the United States! Because we are still involved in full time private practices, we have actually enjoyed the full benefit of the small business tax deductions of our alpaca business. What better opportunity could there be to apply the deductions from developing your small business, than when you are earning near your peak income in your primary business? This could only be possible for us because we agist our animals with seasoned ranchers with a wealth of experience. We are not tax professionals, and we are conservative in applying tax planning strategies, but we have found that even in a "down" market the alpaca industry has been beneficial for our "bottom line"! We are so fortunate to have agisted most of our herd with Jan and Dale Davis of Derwydd Alpacas; icons in the alpaca industry who bring a wealth of knowledge, experience, and limitless enthusiasm to the business. We also have animals with Sonia Marygold of Tanglewood Suri Alpacas--she has been a wise, gentle, and enthusiastic mentor to us. Most of our alpacas are now in the North San Francisco Bay area at our new ranch, Alpacas of Marin! All of our females and breeding males come with a reproductive guarantee, with a free breedback for females to any of our herdsires. We offer free breedbacks to any of the herdsires of Alpacas of Marin for our two Huacaya girls. Our bred girls come with a "live cria" guarantee. We also offer flexible financing. We accept 1/3 down with 1 year interest-free to pay the balance. 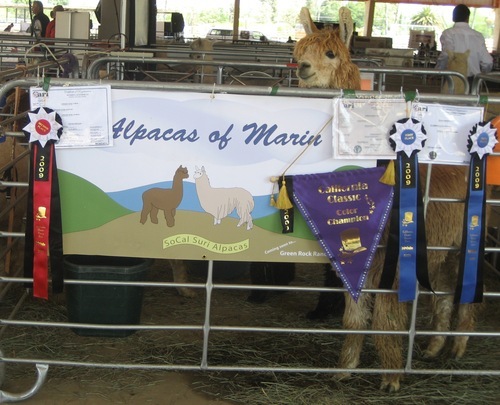 Our Alpacas are mostly at Alpacas of Marin in the North San Francisco Bay area. Feel free to call for a visit! Please note: We are NOT participating in National Alpaca Farm Days in 2016.